I hope that everyone had an amazing, safe, and fun Christmas holiday. I know I did as I took a much needed vacation at work just to relax and spend time with my family while dropping off the grid a bit. This week I’ll be back to the hustle including the cigar review hustle bringing you a review of Bonita Smoke Shop’s Time Warp Corona. 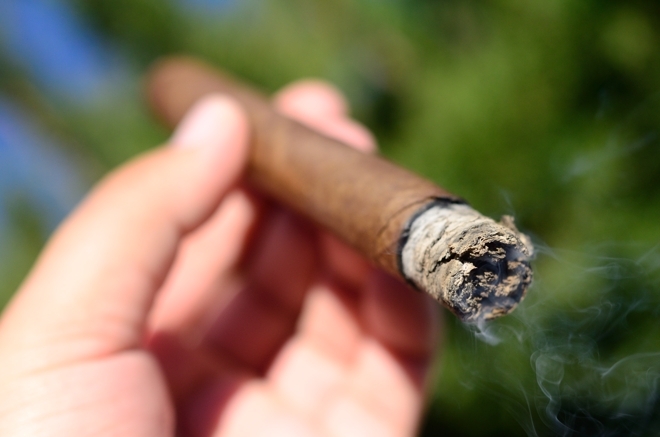 Let me start off by reminding you readers that we always take a non-biased approach to our cigar reviews. Bonita Smoke Shop has always been a big sponsor and supporter of our site, but that doesn’t mean we will give them any extra wiggle room while review their blends. That being said, let’s get to this. Bonita Smoke Shop is a cigar shop located in Bonita Springs, Florida ran by Jackie and her great team. Bonita Smoke Shop is not only one of the larger shops in the area, but she also does tons of mail-orders around the U.S. so it’s not surprising to see that they offer a few house blends of their own. The first blend was the 18th anniversary which I won’t get into but you can read a full review here. The second is the Time Warp which one of our Guest Reviewers Jeff took on the “Big Ben” format and that review can be found here. Today, I’ll be looking at the newly released size of the Time Warp, the Corona. The Time warp was meticulously created by the joint effort of both Jackie and Willy Herrera at the El Titan de Bronze factory in Miami. That name should ring a bell as I am all about El Titan de Bronze and their incredible blends. The Time Warp is one of the blends that El Titan de Bronze utilizes an “Entubado” method of construction on. This method is usually preformed by women with incredible finger dexterity as they roll each individual filler leaf into tubes before before bunching which results in an effortless draw with a much lower chance of issues. 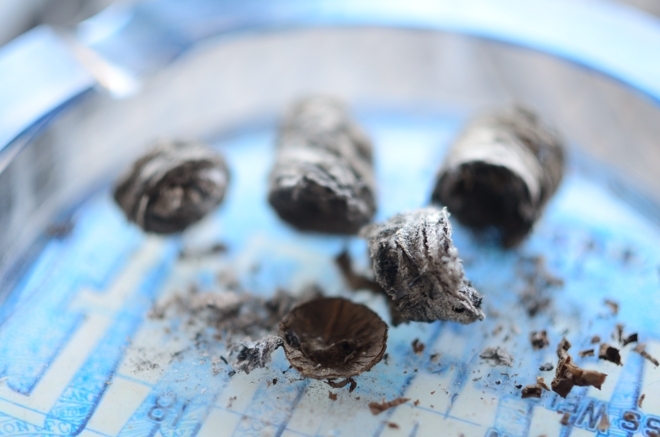 While the exact tobaccos used in the Time Warp are kept a close secret, Jackie has released some information regarding the blend. The time warp is available in 3 sizes, the original Toro (6 x 50), the Big Ben (6 x 60), and the all new corona size called “The Time Zone” (6 x 47). All blends are available in 5 packs, bundles of 20, and the toro is available in a wheel of 50 all ranging between $6.49 to $7.95 a stick. It’s worth mentioning that this is probably one of the more affordable blends I’ve personally have seen coming out of El Titan de Bronze. While I’ve smoked my way through tons of all 3 sizes, this particular batch was sent to me by Jackie herself. You can purchase the Time Warp directly from Bonita Smoke Shop’s website, or contact Jackie on twitter for more information. Bonita Smoke Shop’s Time Warp starts out with a very beautiful, shiny, oily wrapper. The wrapper is silky smooth and a medium/dark brown in color. 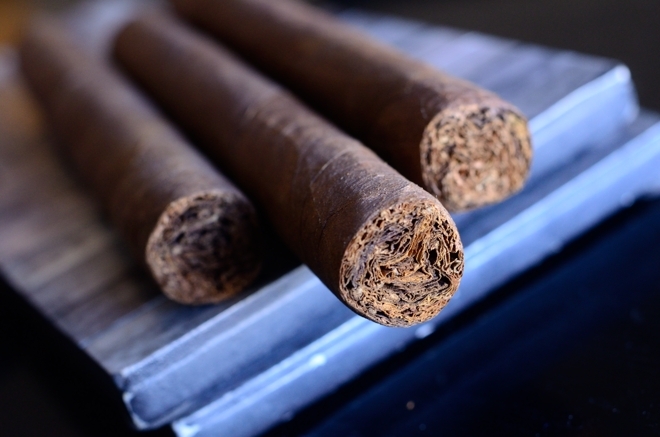 The color is consistent for the most part with some webbing and dark browns around the smaller veins that run through the cigar’s skinny body. 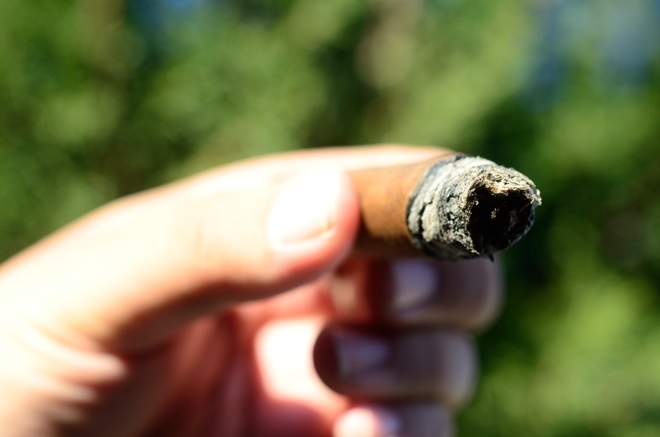 It’s incredible the amount of light that reflects off the oils that cover this cigar. The Time warp is polished off with a round triple cap and no band showcasing the natural characteristics of the cigar and the tobacco used to roll it. 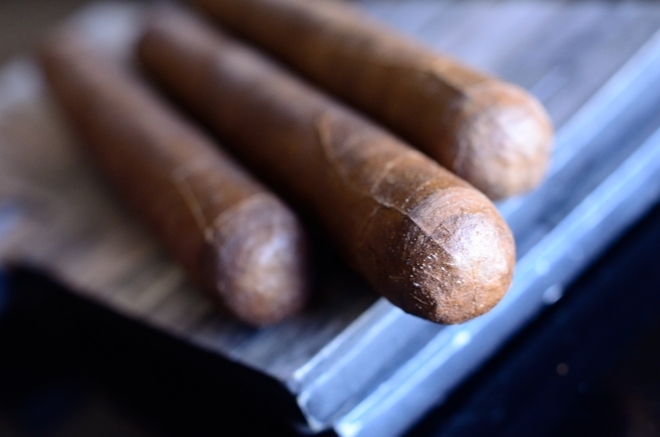 The Time Warp is a bit spongy which is expected due to the entubado rolling method as it remains consistent throughout the length of the cigar. 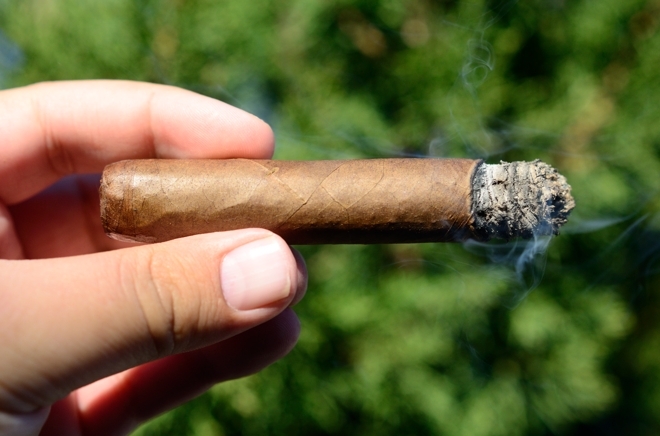 The wrapper on the Time warp is pretty modest with only soft natural tobacco aromas being released while the foot of the cigar carries a bit of spice and oak along with the natural tobacco scents. The cap cut very clean and like butter using my double bladed Palio cutter. Bonita Smoke Shop’s time warp starts off very tart with some bitterness on the lips before transitioning into some strong citrus, cedar, and lots of spice over some deep tobacco flavors. 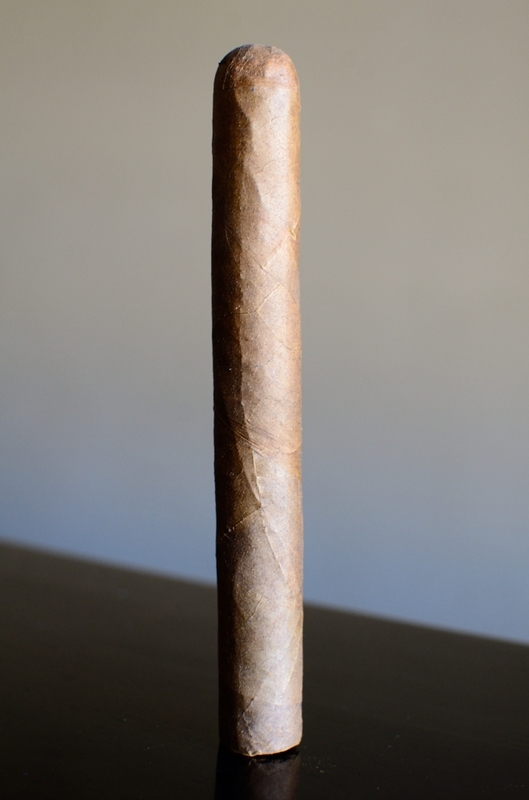 This cigar starts out as bold as they get but then quickly balances out after the first few draws. The draw, as expected with the entubado method is incredibly easy, pumping out huge clouds of thick, white smoke with every puff. The burn line is razor thin and dead solid leaving behind a trail of medium to dark great compacted ash which held on for about an inch before falling into my ashtray. Into the second third of the Bonita Smoke Shop Time Warp and there has been this brilliant mixture of floral flavors and musk that have developed on the aftertaste of each puff. I love it, and it really helps add to the dimension of the Time Warp. The rest of the flavors remain the same with lots of citrus, spice, and oak. The retrohale is way sharper than I expected leading with spice and pepper. The burn line has remained consistent and thin leading into the final stages of the second third. I am also feeling almost nothing in the nicotine department. The more I smoke this thing, the more the floral and musk comes out. I love that, and while I did pick up hints of it in the other Time Warp formats, none were as dominant as they are in the Time Zone, so it may be coming from the wrapper. Again, the Time Warp Time Zone stays consistent in the backing flavors of spice, oak, and citrus with a bit of coffee starting the be mixed in. The flavor profile in this cigar is fantastic while the smoking experience has lived up as well with a clean burn then entire time with no extra attention from my lighter needed. It took me about an hour and half to take The Zone down and I experience absolutely no harshness or heat, nor did it leave me with much of a nicotine kick. The Time Zone is a wonderful extension to Bonita Smoke Shop’s Time Warp line. I enjoyed the toro very much, thought the Big Ben was good although it’s not my size preference, but the Time Zone is in a league of it’s own. The smaller ring gauge really lets the flavors from the wrapper shine through creating a much fuller experience. The flavors are balanced, creamy, and enjoyable especially the floral and musk flavors I picked up through the second half of the experience, flavors that were much more pronounced in the Time Zone than the other two formats. The construction, as expected coming out of El Titan de Bronze was spot-on and the price is incredible. You get a lot of cigar for such little coin. This is easily a bundle purchase and I am glad to have them on hand and in my regular rotation. 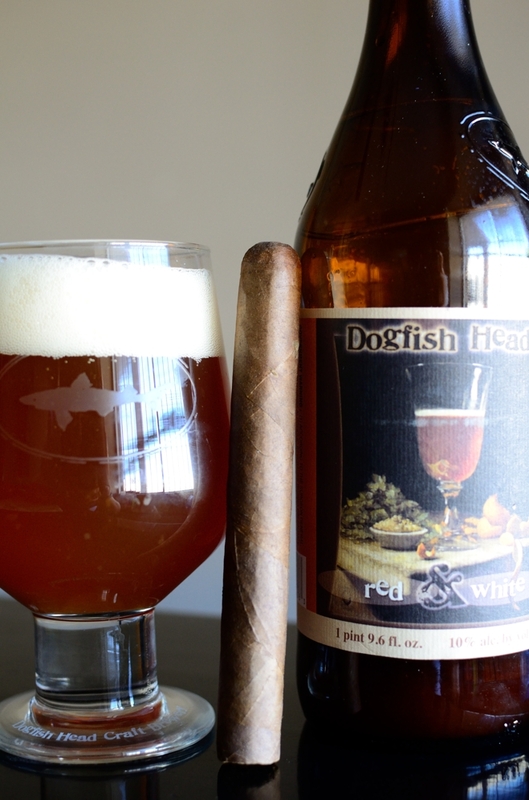 Dogfish Head is known for some very experimental brews, the Red & White is a Belgian Style Witbier brewed with coriander and orange peel and fermented with pinot noir juice. After fermentation a fraction of the batch is aged in oak tanks before being reintroduced to the beer. Coming in at 10% ABV this beer starts off very boozy with some sharp citrus and wheat with a heavy mouthfeel before finishing with lots of booze and caramel on the finish with some nice spice aftertastes. The reason I decided to pair this with the Time Warp was evident as the citrus and spice married up incredibly well with the flavors in the cigar. I’d also recommend pairing the Time Warp with some light wine, creamed coffee, or a smooth marzen. Like you, I enjoyed the Big Ben, although it’s a larger size than I’m normally comfortable with, and really like the original toro, but this new size would seem to hit all the right notes for me. I think you’re right about the wrapper ratio, and I can’t wait to try it. I’m looking forward to seeing what you’ll be starting off the new year with.